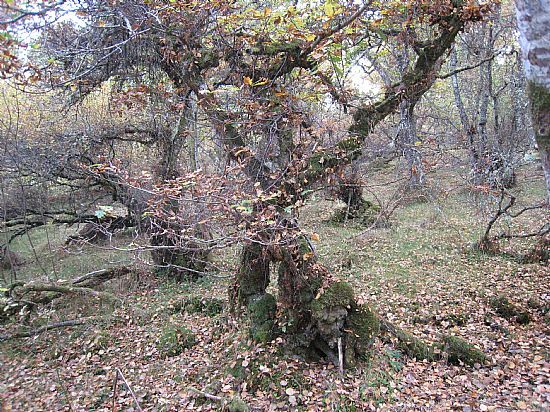 The predominant tree species in the Gearrchoille are oak, birch, aspen, hazel, Scots pine, willow, alder, juniper and rowan. There are isolated specimens of holly, beech and whitebeam. Walking from the car park along the all-abilities path, you first pass through an area of thick birch regeneration. This is one of the areas that we have begun thinning, as per management plan. This work will be continued over the next several winters, thus producing areas of birch regeneration at different stages of growth. There is evidence that coppicing has long been used as a form of management in the Gearrchoille. It was most probably used to provide firewood. Thinning allows light to reach the woodland floor, thus encouraging vigorous vegetative growth, providing food & shelter for fauna in the wood, and allows the best specimens to grow on to maturity. The woodland canopy is dominated by birch and oak, with locally abundant aspen providing the tallest trees in the wood. There is hazel in the drier SW area of the woodland, and willow predominantly in the wet areas near the Alltan na Beiste, which flows through the curling pond. For full details of the NVC communities, see Ruth Maier's survey. There are a few specimens of Whitebeam occurring near the path of the drove road. It has been suggested that these were introduced by the cattle passing through the wood. See our tree leaflet here. There are so many characters in the Gearrchoille. Here are just a few. See how many you can find in the wood. 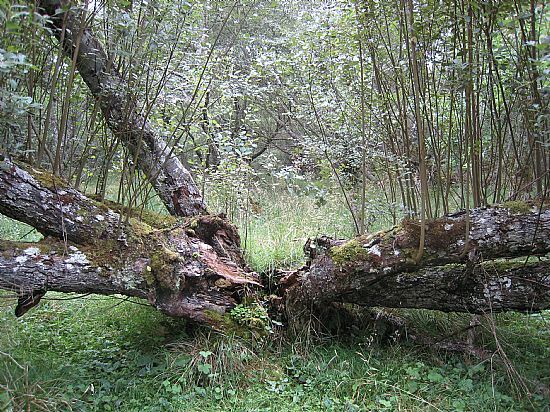 Alder (Alnus Glutinosa, Gaelic: feárna) is often coppiced or of bushy habit, but it can grow to 20m. It thrives in damp conditions, even in swamps, its roots fixing atmospheric nitrogen for its own use and to feed the ground cover plants that grow alongside—often primrose & violets. The male catkins are maroon, opening to green in Feb. The female catkins resemble small cones. Both these and the seeds float easily—which helps with dispersal of the seeds from the trees which often grow on riverbanks. The leaves & bark have been used to produce black or brown dyes. The timber is an attractive red colour, and very water-resistant, hence its use for water-wheels, bridges, piers. 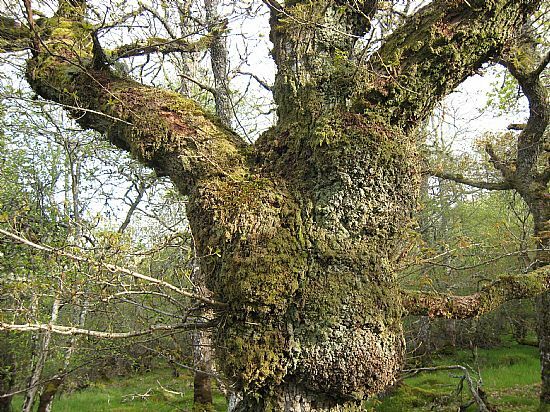 Alder is common throughput the Highlands—the Mound Alderwood is the largest area of Alder in Britain. Birch (Gaelic: beithe) is a pioneer tree. It was the first tree to colonise our hills & glens after the retreating ice. It grows in a wide variety of soils and climates and supports a large variety of flora & fauna. It is a fairly short lived tree, rarely more than 80 years, reaching a height of about 30m. It can dominate the landscape , but eventually will get shaded out by larger & longer lived trees that succeed it. Both varieties of birch, silver and downy (Betula pendula and Betula pubescens) grow locally, but it is the downy birch that predominates in the Gearrchoille. Birch timber is used for furniture, bowls and fuel. The sap, collected in March is still used to make wine. 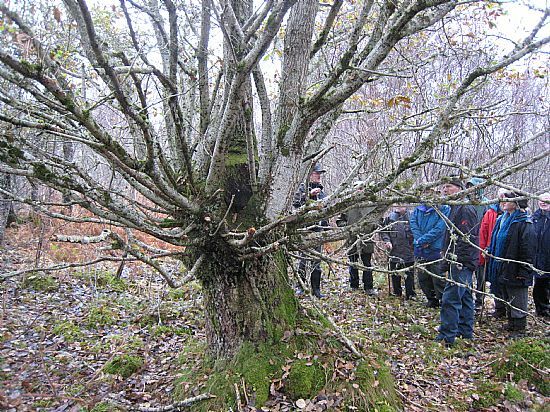 Hazel (Corylus avellana, Gaelic:calltainn) grows throughout the Highlands—it is particularly common in Argyll, spreading northwards with birch 10.000 years ago. It often grows alongside oak & with primroses and honeysuckle. Male catkins visible through winter, opening to bright yellow, 8 cms long in mid-Feb, followed in March by small bright red tufts, which are the female flowers. 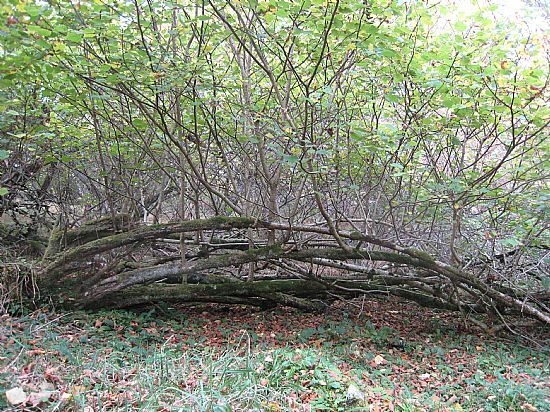 These mature to produce edible nuts in late Sept.
Hazel is often coppiced on an 8-year rotation, which produces straight stems used for hurdles, creels, shepherds crooks, and shinty sticks. Scots Pine (Pinus sylvestris, Gaelic: giuthas) was a major component of the Caledonian Forest which once covered large areas of the Highlands. Trunks are commonly tall (to 35m) & straight. Male & female flowers are on the same tree—the small male flowers releasing clouds of yellow pollen to be caught on the tiny red buds of the female flowers found on the tips of the new spring shoots. These develop over 2 or 3 years to become cones filled with ripe winged seeds, which are released when the weather is warm and dry. The timber is resinous, producing tar used by boatbuilders, to seal the planks, which were also often pine wood. Aspen (Populus tremula, Gaelic: critheann) are the tallest trees in the Gearrchoille, the leaves turning bright yellow in autumn. The male & female catkins appear on separate trees, although Aspen rarely flowers or sets seed in Scotland, but spreads by suckers. The nutrient rich bark supports a wide range of mosses and lichens, and many insects are associated with the trees—including Aspen Hoverfly whichfeeds on dead wood. Aspen timber is pale, lightweight & strong, useful for oars, but there was a taboo against using it for fishing or agriculture implements or house building. 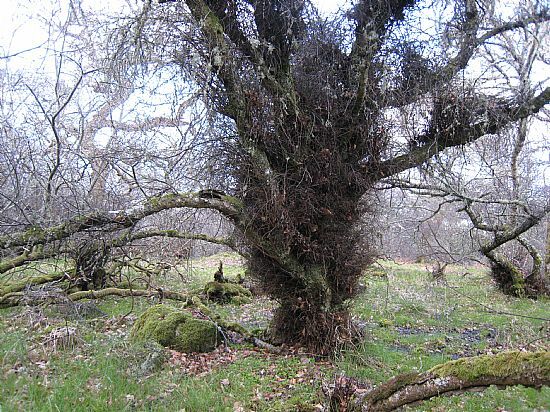 There are two varieties of oak (Gaelic: Darach) native to Britain. 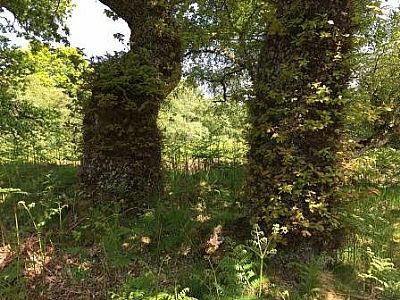 Common or Pedunculate Oak (Quercus robur) and Sessile or Durmast Oak (Quercus petraea). The two forms are similar, but distinct in the way they carry their leaves and acorns. On the Sessile, the acorn cups are on a very short stem, whilst the leaves, which have no ears at the base, grow away from the twigs on a leaf stalk of 10-25mm. The two oaks readily cross, and judging by the characteristics of the trees in the Gearrchoille, I would suggest a number of these are hybrids between the 2 species. New shoots appear on Oaks in July/ August – known as Lammas growth – which brings new colour to the trees and means they retain strong leaves well into the autumn. 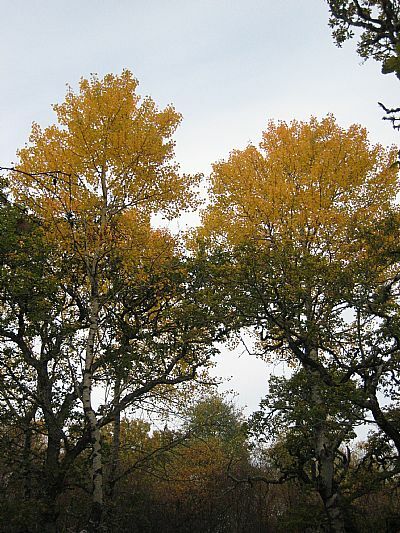 Oaks are the most important trees for supporting wildlife, particularly insects, in Britain – more than 500 species. The bark is also home to numerous lichens and mosses. Acorns have been used as food for pigs, deer, squirrels, mice & in times of hardship, man. Oak –leaf wine can still be bought today. Oak galls (formed by the oak in defense against gall wasp) can be used to make ink; the bark was used with copper mordant to produce a purplish wool dye. 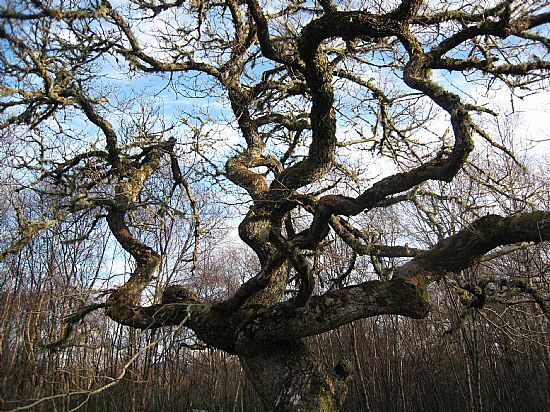 Oak is a very long-lived tree, the oldest surviving to 800 or more years, after the first century the oak only grows at about 2.5cms/ year, so the wood matures as it grows becoming very hard & close-grained. Oak timber was used for ships and beams for building. 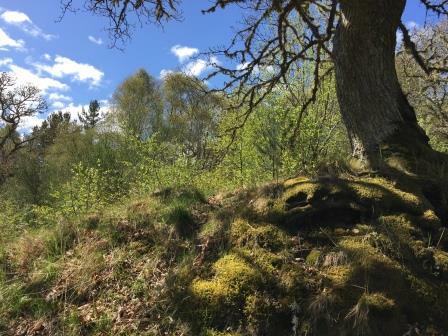 Oaks woods were often coppiced on a 20 year rotation, which provided a regular crop of smaller timber for firewood and fuel for iron-smelting (at Bonawe and Furnace) , also bark for tanning. The mystical associations with the Oak are numerous. It was the tree of Dagda, father of the gods of Ireland; it was the most sacred tree of the druids, who worshipped in Oak groves; Merlin’s wand was said to be made of oak. Oak is struck by lightning more often than other trees – which was seen as a communication between sky gods & man. Willows are generally small trees, to 10m, and grow well in wet ground - the curling pond in the Gearrchoille was colonised by willow, although the Goat willow thrives on drier ground. Leaf shape varies from oval (Goat Willow) to a more elongated spear shape. Male & female flowers are on separate trees, appearing before the leaves in March & April, the male catkins providing useful early pollen for bees. The Rowan (Sorbus aucuparia, Gaelic: chaoruin) grows to 20m with a smooth, shiny grey bark. 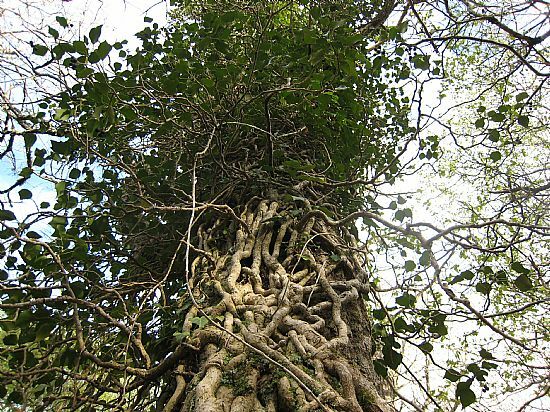 It grows to almost 1000m above sea level, higher than any other British Tree. It produces clusters (10 cm wide) of creamy white flowers in spring, resulting in clusters of red berries in late summer. The name Rowan is derived from a Norse word ‘runa’, meaning charm, which is why it was often planted by houses to ward off witches. The berries make an edible sharp jelly, similar to marmalade. Great with oatcakes! Also a great favourite with larger birds— blackbirds, fieldfares & waxwings. Rowan timber could have found many uses, but the taboo against felling the trees prevented its use., except for sacred occasions. Twigs of Rowan were placed above doorways as protection from enchantment.